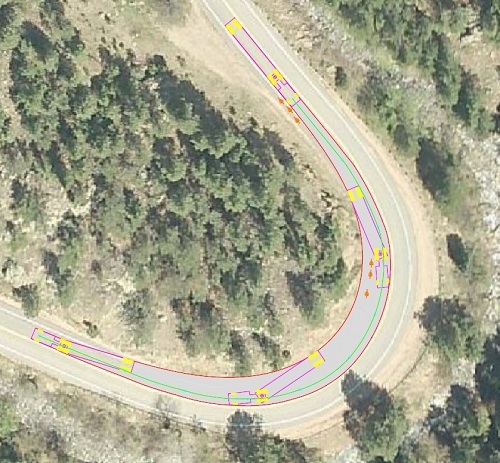 This website aims to help cyclists safely navigate Boulder County canyon roads that were damaged during the September 2013 flood and have received temporary repairs. After the 2013 flood, miles of county roads were damaged or completely washed out. For many canyon roads, Boulder County Transportation rebuilt the roadways by hauling in thousands of tons of dirt in order to create a temporary “winter road” that would allow residents and recovery workers access the area. In 2014, James, Lefthand and Fourmile Canyon drives all received temporary asphalt surfaces to ensure roads remain safe and passable for all users until permanent repairs can be completed. Lefthand Canyon Drive has been permanently rebuilt – Go check out the new, wider shoulders! Permanent reconstruction of James Canyon is underway. Cycling will be tough as there will only be one lane available for all travlers most of the time and there will be no shoulder. Permanent reconstruction in Fourmile Canyon has started on the upper stretches of the canyon and through Gold Run. Work on the lower portions of Fourmile is set to begin on Tuesday, Sept. 4, 2018. There are daytime cycling restriction in Fourmile Canyon from 8 a.m. to 4:30 p.m., Monday through Friday due to the high-volume of large truck and equipment traffic heading up and down the canyon each day. Because permanent roadway reconstruction has not been completed in all canyons yet, the asphalt overlay will be easier and less costly to maintain throughout the winter and will improve safety by reducing the number of potholes, ruts, and potential for washboarding. If you’ve been up on canyon roads since the flood, you’ve seen the current condition of the roadway, which is why it’s extra important that all riders and drivers stay alert and aware of their surroundings at all times. There are many spots where the uphill shoulder simply disappears because the road was washed out. This forces riders into the main lane with vehicles and will likely slow down traffic. Remember, always share the road. Cyclists have as much right to the lane as cars do. Please wait until the field of view is open and there are no blind curves ahead before passing a cyclist in the main roadway. Cyclists are only asked to ride as far to the right as possible to be safe, which can be tricky on a Boulder canyon road. Boulder County is asking all cyclists to ride single-file when heading west on canyon roads. In most instances, cars can travel uphill faster than almost all cyclists, so please ride single-file to give them as much room as possible to pass you. Throughout the recovery and reconstruction effort, large trucks (like the ones at the top of this page) will see heavy use on canyon roads – Up to 30 or 40 trucks during weekdays in Fourmile Canyon – that’s 60 to 80 round trips. When a truck of this size is rounding a tight curve, the cab (front) will be towards the center lane, but the rear wheels will track towards the shoulder where you may be riding. Motor vehicles should attempt to give cyclists as much room as possible when passing. By law, drivers must give cyclists 3-feet of room when moving past them. That’s 3-feet from the widest point of the vehicle, which is typically the side mirrors, but can also be a trailer in tow. Vehicles can cross a double-yellow line to pass a cyclist. The yellow lines advise drivers that they should stay in their lane due to a reduced line of sight, whether it be due to a curve ahead or the road is moving over a hill. It is not against the law to cross the double-yellow line. Just be safe when doing so. Just like when passing another vehicle, you should always utilize your blinker when starting and completing a pass of a cyclist. Cyclists are required to have a headlamp and a rear reflector when traveling between sunset and sunrise. A taillight is also recommended. Riders are also encouraged to wear bright clothing that can easily be seen in diminished light conditions. Both cyclists and motor vehicle operators need to understand that conditions are tough for every user, but that they problems are only temporary. Boulder County is working diligently on repairs to its infrastructure. The September 2013 flood event has been hard on almost everyone in Boulder County in some way or another. Please share the road. Did you know that orange-colored sings are advisory in nature? Like construction signs, they inform roadway users of conditions ahead. Yellow signs are also cautionary in nature and serve as a general warning that conditions are changing ahead. Did you know that white and black colored are regulatory and must be adhered to by all users? Speed limits must be followed or law enforcement may want to chat with you. Red signs almost always mean STOP! Either because it’s a Stop sign or because you’re about to head the WRONG WAY. Green means GO. Typically directional in nature. Subscribe the Boulder County Biking email listserv to receive timely updates about cycling around Boulder County, including roadway closures and other restrictions.